Immigration procedures are incredibly complex, frustrating, and often unfair. At Prizant Law, we defend, protect and secure immigration rights of individuals, families, and businesses. We assist those seeking asylum and cancellation of removal. We assist those seeking assistance with deportation and removal proceedings. Our attorney team assists those seeking green cards. U.S. citizens may petition for family. Our law firm assists those seeking all types of visas, including business and work, fiance, family, investor and temporary. Our team can help you request a provisional unlawful presence waiver. Our firm assists those seeking naturalization and citizenship. We assist those seeking permanent residency and labor certifications. Our firm assists those seeking permanent residency using VAWA petitions under the Violence Against Women Act (VAWA). We were referred to Svetlana by a family member who spoke very highly of her, as she was able to win their case after two other attorneys could not, we used her to apply for a U-VISA, she was able to convince the DA office to certify us for the U-visa and filed everything with the USCIS within a month. She is a very strong immigration lawyer. Svetlana helped me apply for VAWA, and completely changed my life. I lived in fear before and my spouse was always threatening to report me to immigration, and with no way to support myself I was afraid to leave her, but Svetlana advised me to file for VAWA and I got my work authorization very quickly. I have since left the abusive marriage and I am living new happy life. Svetlana is great immigration lawyer that I can recommend to anyone. Svetlana helped me file for my husband’s green card. She was very knowledgeable and always responded to all my questions. It took only 10 month to get the case approved and we didn’t even have to go to an interview! She is great. Svetlana helped my cousin to became a US Citizen. I helped with translation and can tell you firsthand that she was honest with her evaluation of case, was able to give heads up with all potential outcomes, and clearly identified all pros and cons for each of the options. Her assistance during the interview preparation process and her been with my cousin during the interview definitely played a positive role in him getting US Citizenship. I would highly recommend Svetlana to anyone in need of immigration lawyer. Prizant Law helped member my family to avoid deportation when 2 other local law firms told me that there is nothing they could do at that point. Svetlana knew exactly what needed to be done and when. She instructed us on what documents were required what to expect. I highly recommend Prizant Law to anyone in need of immigration help. I had really complicated case, this immigration lawyer was very helpful, she met with me initially when I was in panic, scared and lost thinking that my wife will get me deported. Svetlana gave me hope, and explained the option to apply for VAWA. my case still pending, but I received my travel permit and work authorization within 90 days of her submitting all paperwork. than kyou. I came to Prizant immigration Law for help with petition to remove conditions on residence. Mrs. Prizant and her associate were extremely helpful and well organized. They went above and beyond to make sure that all documents were in order for I-751. I would recommend this law firm to my friends. My Application for Naturalization N-400 was initially denied due to an arrest I had 6 years ago. I hired Mrs. Prizant and she helped me gather the necessary evidence to counter the arrest, she also attended the naturalization interview with me and argued with the officer on why the arrest should not affect me naturalizing. I am now a US Citizen, thanks to this amazing immigration lawyer. I hired Svetlana to help my son become a United States Citizen as I had him oversees and was not married to his mother. Svetlana knew immigration law like no one else we consulted. Because the law on derived citizenship was changed a few times and most attorneys we spoke to had no clue. She just a good lawyer, always answers calls and ready to help, needles to say that my son will soon become united states citizen. I've dealt with many attorneys in the past but Svetlana was the most honest attorney that I ever worked with and she really cares about her clients. I could always reach her by phone. She always answered my phone calls, and if I left a message, she called back promptly herself. I wish she had worked on my case from the beginning, I would have saved time and money, with her help I finally got a green card after 10 years of going to different attorneys. "I found Svetlana via her firms website, my initial consultation was very informative and she knew all the relevant facts about my immigration options, I was in deportation proceedings at the time. She always made herself available and answered all my queries promptly and concisely. 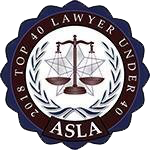 Svetlana made me feel that my case was her top priority; she was able to move up my hearing date and close the proceedings against me, shortly after I received my green card." "Mrs. Prizant is an incredibly effective attorney. I was amazed at how responsive and always answered my emails even on the weekend. I had a very complicated Petition to Remove Conditions on Residence, and she made sure everything was done and submitted properly . Mrs. Prizant did everything to make this complicated time and processes very smooth and stress free for me. She kept me informed every step of the way, everything she said she would do when I retained her she did. She is an amazing advocate!" "I would like to extend my gratitude to Svetlana for helping me battle and win my case. Her experience, knowledge, and commitment is what got me results. 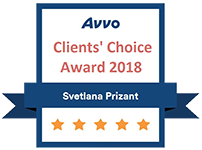 Svetlana came highly recommended by a friend, and although I already pursued the case twice unsuccessfully with two different attorneys, Svetlana was able to win my case. The overall success of this case was due to her vast knowledge and firm handling of the situation. I would highly recommend Svetlana to any and all who seek assistance." I can't imagine the outcome of my legal papers without Svetlana's resourcefulness, creativity and professionalism. She is extremely competent and knowledgeable. I strongly recommend her to anyone who is looking for a solution, quickly and thoroughly. My husband and I hired attorney Prizant to come with us to an interview with the USCIS to remove conditions on my green card, and we were so happy we did. When the decision was not issued in three months, she filed a petition requesting a decision, it came within a week and I received my permanent green card. If it was not for her professionalism we would most likely have to go for a second interview and my Green Card would have been denied. 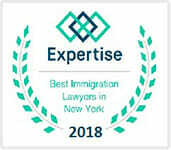 I had a very complicated case and worked with two other law firms in order to solve my immigration issues over the last 20 years without any positive results. Only with Mrs. Prizant’s help I was able to get a green card. Thank you for being so professional and knowledgeable. Mrs. Prizant is a great lawyer! She is a friendly and competent and she really cared about my case. She always promptly responded to all my emails and other questions. I am very grateful to her for helping me get my green card. My case was very complicated and I was working with another lawyer for 3 years with no results. When I gave my case to Svetlana, she immediately got it moving and I got my permanent green card in 5 month! I’m tremendously grateful to her and really inspired by her enthusiasm and love for what she does. She’s highly recommended! 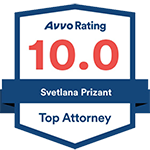 Prizant Law has received a 10 out of 10 "Superb" rating on Avvo, the nations leading legal forum. We are experienced dealing with green cards, visas, deportation, asylum & much more. Our office is conveniently locate next to Rego Park, Flushing, Briarwood, Woodside, Elmhurst, Jackson Heights, Middle Village, Jamaica, South Ozone Park, Fresh Meadows, Woodhaven, Kew Gardens, Glendale & Maspeth, NY. We are a short subway, bus or car ride from all parts of Queens, NY. Prizant Lawhas the experience necessary to handle all your immigration law issues including: Asylum, Deferred Action, Deportation, Removal, Family-based immigration, Green cards, Naturalization, Citizenship, Visas, Waivers, Cancellation Of Removal, Deportation Defense, Language/Civics Exam Exemptions, Adjustment of Status, Affidavit of Support, Consular Processing, Removing 2- Year Condition on Green Cards , Visa Bulletin and Child Status Protection Act , Deferred Action for Early Childhood Arrivals Special Immigrant Juvenile Status, Change of Status, Extension of Status, Immigration Court Proceedings, Waivers of Inadmissibility, Immigration Appeals, Political Asylum, Prosecutory Discretion, Student Visas, Visitor’s Visas, Business Visas, Fiancé Visa, Religious Worker Visa, Investment Visa, Adjustment of Status with EWI, Reentry after Deportation, Criminal Records Waivers, Pardons, Travel, Re-entry Permits, Victims of Crime Relief, U Visa, T Visa, Violence Against Women Act, Vawa, Notice of Appeal of Decision, Waiver of Grounds of Excludability, Temporary Resident, Waiver Foreign Residency Requirements, Refugee, Provisional Unlawful Presence Waiver, Advance Processing, Advance Processing of Orphan Petition, Request for Asylum, Extension of Nonimmigrant Status, Immigrant Petition by Alien Entrepreneur, Waiver of Rights, Petition for Legal custody for Amerasian, Application for Removal, Notice of Appeal, Petition for Amerasian, Petition for Widow, Petition for Special Immigrant, Immigrant Petition for Alien Worker, Petition for Alien Fiance, Petition for Nonimmigrant Worker, Replace Alien, Registration Card, Employment Eligibility Verification, Parole in Place, Immigration for Members of Military, Parole in place/members of military, Section 247(b), B1, K1, O, R1, I-130, I-131, I-134, I-140, I-191, I-192, I-193, I-212, I-243, I-290B, I-360, I-361, I-363, I-408, I-485, I-485 Supplement A, I-485 Supplement B, NACARA, I-485 Supplement C, HRIFA, I-508, I-508F, I-526, I-539, I-566, I-589, I-600, I-600A, I-601, I-601A, I-602, I-612, I-687, I-690, I-693, I-694, AR-11, G-28, G-281, G-325, G-325, G-325A, G-639, G-845, G-845S, G-884, G-1041, G-1041A, G-1145, I-9, I-90, I-102, I-129, I-129F & I-129S.